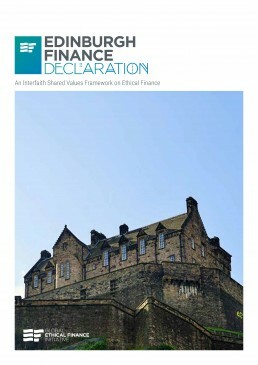 ‘The Edinburgh Finance Declaration’ – The Church of Scotland and the Islamic Finance Council UK (UKIFC) will officially unveil an interfaith shared values framework on ethical finance at a reception in Greyfriars Kirk this evening (Tuesday 23rdOctober 2018). The event marks the end of the international Ethical Finance 2018 conference that has convened 300 experts in Edinburgh this week. The shared values – which include Stewardship, Love of the Neighbour, Human Flourishing, Sustainability and Purposefulness, Justice and Equity, and Common Good – align contemporary trends in the financial markets such as climate, UN Sustainable Development Goals and impact investing. The Declaration is designed to inform the development of financial products that support an ethical economy. It also provides a values framework that can inform organisational cultures to help rebuild the loss of trust in financial institutions and markets that has arisen since the global financial crisis. The Global Ethical Finance Initiative (GEFI) is a global movement and co-ordinated programme of ethical finance projects and activities originating from Scotland. GEFI consolidates some of the pioneering ethical finance work being undertaken in Scotland under one brand to create a compelling global proposition.